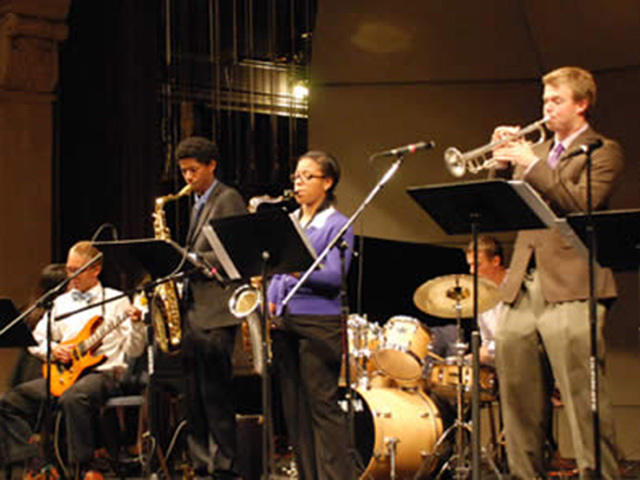 The USD Jazz Ensemble was created in the Fall of 2010 in response to student interests and backgrounds, and to provide students the opportunity to perform the rich and challenging music of one of the U.S.'s native art forms. The Jazz Ensemble consists almost entirely of USD students (with some special guests) playing for both the USD campus and occasionally for the San Diego community. The Jazz Ensemble rehearses every Wednesday night for two and a half hours and gives at least one on-campus concert at the end of each semester. The Music Departments expects that the Jazz Ensemble will continue to grow and develop, that the student musicians will enjoy more performances in the community and connect with peers on- and off-campus, and we welcome students to join and help the Ensemble become a larger presence in campus life. The director is Justin Grinnell (DMA candidate, USC), who has been a well-respected leader in jazz performance and instruction in San Diego since 1999. He plays a variety of instruments but specializes in acoustic and electric bass. USD students can enroll in the Jazz Ensemble for one credit each semester, without limit. Three credits will fulfill the students' CORE Fine Arts requirement.